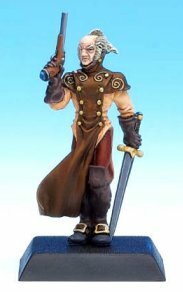 Colonel Marbles Miniatures Masterworks December 2001! Some more of the new Foundry 'Nymphs'. Nice. Wow, that masked man is incredible! I love it! Thats some f***ed-up sh*t right there! 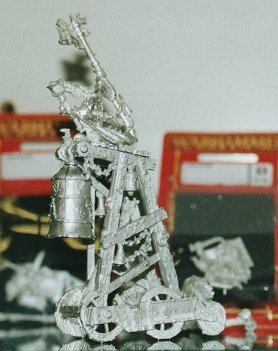 A sneak preview of GW's new Skaven 'Screaming Bell', thanks to the boys at New Wave. Yes but what is the point of it? It looks silly and a bit pointless to say the least. I could see the point of the Doomwheel which is always a good laugh but this bell thing? 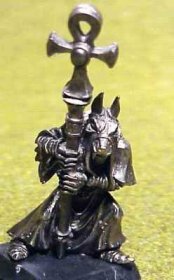 20UKP for that thar thingy, 2 quid more than the (almost entirely pointless) Dwarf "Anvil of DOOM!™" set. 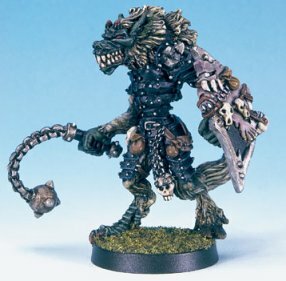 I'm sure these things have incredibly overpowered effects in Warhammer, but try convincing your regular opponents in any other game that you need new rules covering the effects of fervent bell-ringing (or indeed rabid metalworking). 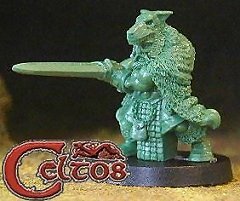 New heights of nonsense to flog unfeasible and overpriced miniatures. Poo. Hmm, they look very stylised and angular. Not unappealing I suppose, but a bit wierd. Pretty good, nice for a Norse dwarf personality I reckon. Some new-ish Germans from Icon/Black Tree - not bad for the price really. By popular demand, more Celtos greens !! Three of 'em actually. 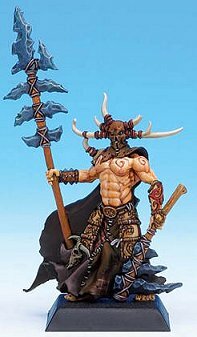 Some of GW's new High Elf 'Shadow Warriors' which are very nice indeed - the pics in White Dwarf this month are clearer - this is the best image I could find online. 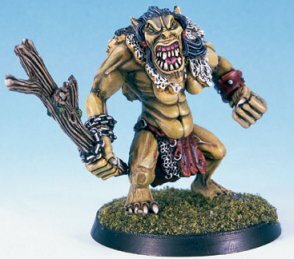 Gonna get them I think, dunk 'em in a pot of green paint & call 'em 'Wood Elves' why not ! Three for £5 eh? 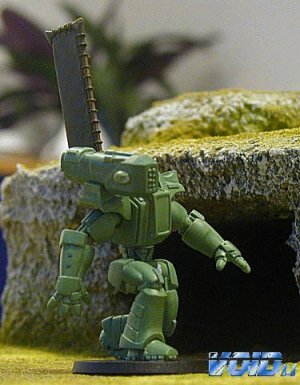 Is that the entire range cos its the only pic I could find too (apparently the minimum unit size in WarHammer is 5...)? Dunno. They are not actually released until end of Jan. Will find out then but I suspect there will be at least 8 different figs. 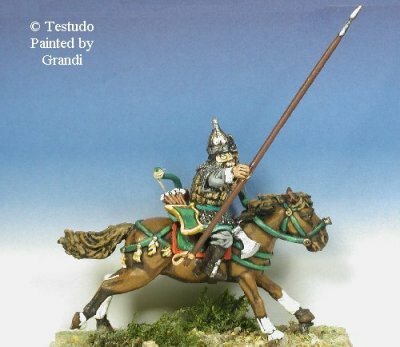 Hey, that doesn't look like leather armour- you sho' you is wood elves? Yes there is some armour there, made out of oak slats no doubt. 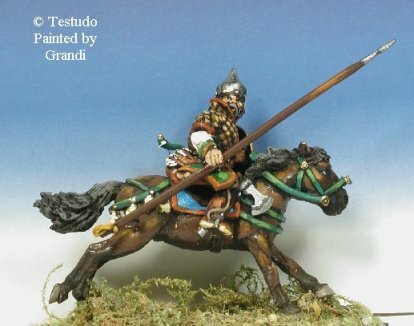 Oak slats dipped in polycarbonate resin I expect, to give extra-heavy armour with no movement penalty..? Nice, good synamic posing on the horses. Detailing on the faces looks pretty good from these pics and the ones on the website. Well we just put it in a context where it can mean something and Bob's yer Aunty. We can use it all the time in our home-grown rules. Thats a good idea! Synamic, synamic... acting in an identical way perhaps, so units in a command that perform the same manoeuvres over the same distance get to use a "synamic order" that costs less command points than moving them individually. More mini's from everybody's favourite Colonel! 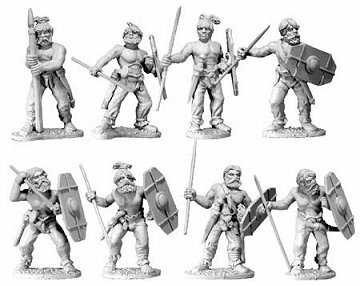 Today its some nice new mercenary Greeks from Foundry. Yea! They look good and battle-hardened, a nice counterpoint to those fresh-faced young soldiers in other ranges. Great for veteran/mercenary units or personalities I'd say, which is exactly what you'd be visiting the Foundry for anyway. 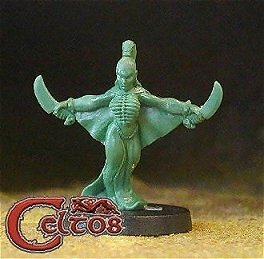 When cometh the new Foundry Celts, anyone seen any previews? 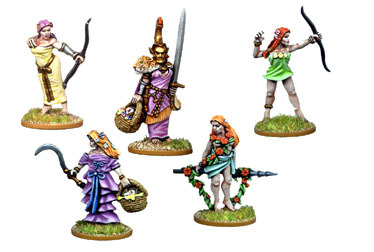 Will there be 'civilian' figs like with the other new ancients? 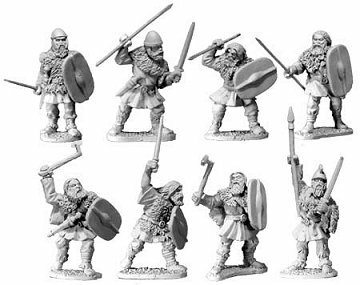 A selection of the best from the WoTC D&D 'Chainmail' range. A weird mix of the pretty good & very poor. 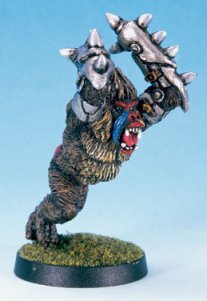 The gnolls & monsters are ace but the elves, men etc are jank. If you want to see more look on the New Wave site. Dire Badger Doc, Dire Badger! Not sure the humanoids are all as bad as you say Colonel, but they certainly aren't as good as the monsters (as shown here). 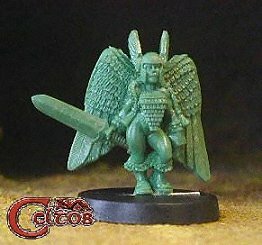 The WotC website also features fully painted pics of the new releases, painting guides and pdfs of buildings you can print and build, actually a fairly good resource. 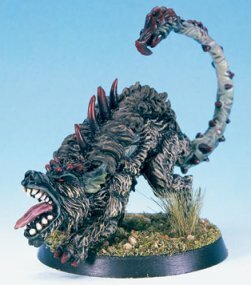 As glossy as GW's site and probably more useful despite its youth. Newsflash fantastico, Wizards/Hasbro do something useful! Hey yeah. Them buildings are pretty cool. Think I'll print out today. 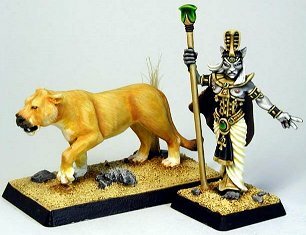 Really not sure what use those animals are, unless you were creating a Noah's Ark Blood Bowl team. Baboon linebackers!? I'm sure it all has a very sensible explanation in the background to the game. When I saw the name "Dire Badger" I had such hopes too... I wonder if they'll expand the range (badger scouts, badger pack, badger command). Does anyone out there manufacture just plain old badgers?? It is a badger Dep, thats why its called a "Dire-Badger". Actually its not that dire, I think WotC have been a bit modest there. 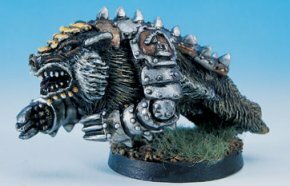 Its a bit silly, an armoured burrowing mammal, but dire? 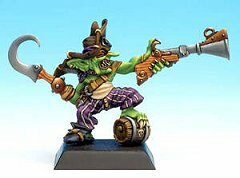 Painting is OK I think, at least they avoid the worst excesses of GW neon daubs. Though if you didn't like them the humans/elves are worse. Well the Colonel has left me holding the fort again, as he trots off to the Greek island of Nymphos. I should warn any junior officers, if this is your first Christmas with the regiment, that although the Colonel is always in a good mood when he sets off, he is incredibly foul-tempered upon his return. So lets keep things ship-shape eh? 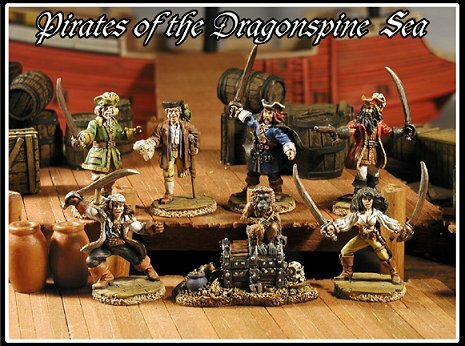 Talking of shipshape, US manufacturer Reaper has taken a slight sidestep from their regular fantasy personality offerings to bring us a box of poirates! And right swarthy seadogs they look too. 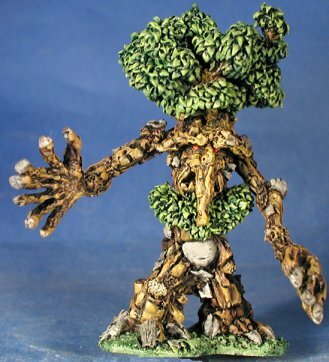 Also on Reaper's up and coming list is this Treeman, which might catch the Colonel's eye despite his ambivalence towards Reaper's offerings. And watch out cos they apparently have a T-Rex on the cards- I believe "Coming in August" means August 2002, though their site does take a while to register updates. No pics yet anyway, so its still HLBS for your dinosaur needs. What, you want some greens? 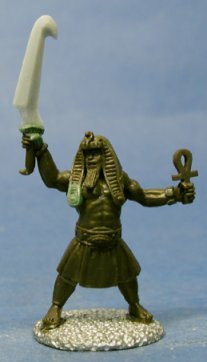 Not often I hear that at the Christmas table... ok then heres an egyptian-type guy who might find his way into your aegyptus-style army. Ah well, I'm off to enjoy a brandy before the Chaplain gives a midnight mass- if there is a lull in the fighting (cook and the chaplain haven't been seeing eye-to-eye recently) I may be able to get another Masterworks out before the Colonel returns. Merry Christmas, and keep frothing! Good to have you back sah! Just back from sunnier climes ! 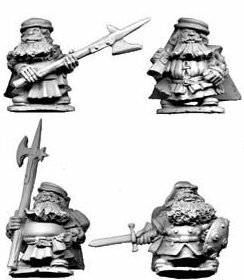 Here's a couple of bits you may have missed - a cool new sci-fi dreadnought type thing from VOID & a few of the new 'swashbuckler' dwarves due in from Foundry. Good New Year ya'all ! !